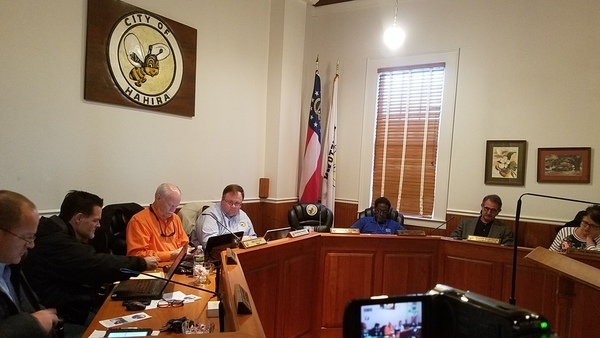 Many thanks to the Hahira Mayor and Council for passing a resolution in support of the water trail for the rivers that run less than six miles west (the Little River) and east (the Withlacoochee River) of the Hahira Courthouse where they met. Left to right: Council Patrick Warren (District 3) Mayor Pro Tem Kenneth Davis (District 2), Mayor Bruce Cain, Empty Chair for City Attorney Rob Plumb, City Manager Jonathan Sumner, Council Terry Benjamin (District 1), Council Mason Barfield (District 4), City Clerk Lisa Mashburn. I spoke briefly at their Work Session, Tuesday, January 30, 2018, outlining the Withlacoochee and Little River Water Trail (WLRWT) and the resolution, and I invited them to upcoming WWALS outings. Several of the Council had positive comments. Council Patrick Warren also mentioned his fear of snakes. I told the story of my English cousin and the alligators. Some people fear snakes, other fear alligators, and even more fear spiders, but actually the rivers are pretty safe. Council Mason Barfield had asked for a previous agenda item how much it would cost the city. As I did for the other resolution, I pointed out that this one would cost the city nothing and commit it to nothing beyond saying it likes the water trail. There was some further discussion, after which they put the resolution on their Consent Agenda. At their Regular Session Thursday, February 2, 2018, it passed along with the rest of the Consent Agenda. Thanks to City Manager Jonathan Sumner and City Clerk Lisa Mashburn for facilitating this process. Y’all come paddle with us! See also PDF. We will post a signed copy when we get it. Section 4: That we hereby direct each department in the City to work individually, together, and with other governments and organizations to support and implement the water trail. PASSED AND ADOPTED BY CITY COUNCIL OF HAHIRA, GEORGIA, this _1st_day of _February,_ 2018. This entry was posted in Basin, Blueway, Economy, Quality, River and tagged 1 February 2018, Adel, basin, Blueway, conservation, Economy, Franks Creek, Georgia, Government, Hahira, Hahira City Council, John S. Quarterman, LAKE, Little River, Lowndes Area Knowledge Exchange, north Florida, quality, Regular Meeting, resolution, river, south Georgia, Suwannee Riverkeeper, Valdosta, water, watershed, Withlacoochee and Little River Water Trail, Withlacoochee River, WLRWT, WWALS, WWALS Watershed Coalition on February 13, 2018 by jsq.